Brush Measurements & Identification « Master-Sand™ Sanding Brushes – Made in USA. In order to give you an accurate quote for your sanding brushes, we need certain information. If measuring in inches, please measure to the nearest 1/16″. If measuring in metric, please measure to the nearest millimeter. We have included a diagram to help you understand exactly what measurements to take. The best way to determine sanding brush length is to measure the slot in which the brush will be used. Sanding brushes are sold and ordered by this measurement.If you are not able to measure the slot in which a sanding brush will be used, measure the sanding brush end-to-end along the metal or plastic back. We will convert to metric if necessary and round up to the next multiple of 5 mm. Sanding brushes are normally shipped 2-4 mm shorter than the ordered length in order to make sure that all brushes fit the slots for which they are intended. Sanding brushes are sold in nominal heights rather than overall height. If at all possible, measure the sanding brush while it is installed in the hub. Height measurements should be taken from the face of the hub to the tip of the brush bristles (not including any abrasives). You may also give us overall height. If you do so, please make it clear that your measurement is OAH, not nominal height. We will convert your measurements to metric if necessary and determine the actual Master-Sand™ equivalent. Sanding brushes generally (although not always) have flaps cut into the abrasives. We will convert to metric if necessary and round to the nearest whole millimeter. We guarantee flap width +/- 10%; e.g. 20 mm flaps as ordered could be 18-22 mm. The largest brush we can manufacture with no flaps is 600 mm in length. 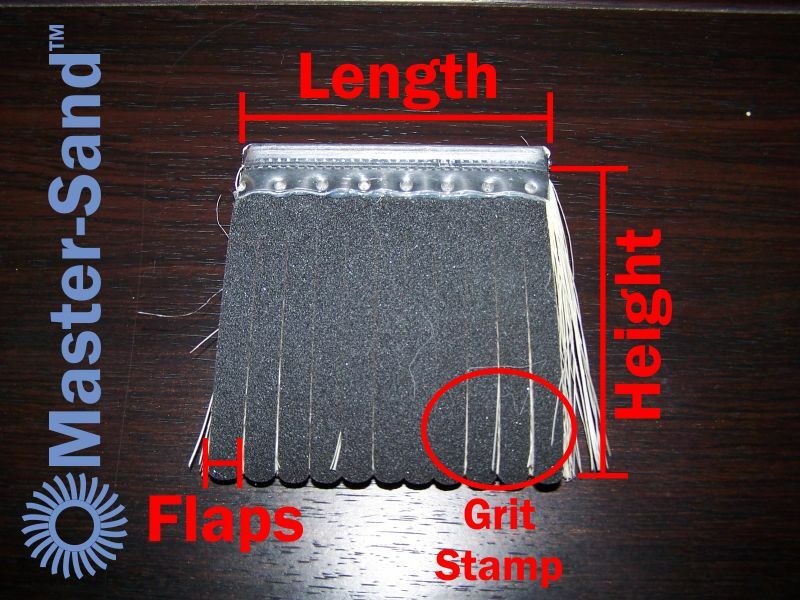 Master-Sand™ sanding brushes generally have the P-grit stamped on the reverse in the location marked in the diagram below. Other brands may have the grit marked on the front side. In general, for any brand of sanding brushes, you can identify the grain type by the color of the sandpaper. Reddish-brown abrasives are aluminum oxide. Black abrasives are silicon carbide. Green abrasives are Cora premium aluminum oxide. Orange or blue abrasives are ceramic. These rules apply 99 times out of 100. If you have questions, please gather all information available about the sanding brush, and get in touch with us. We’re always happy to help identify a brush.